The Outlander writers answered questions about episode 312 on Tuesday, December 5th. Toni Graphia and Luke Schelhaas took control of the Twitter account and answered questions this week. Below are the answers provided to fans this time around. #OutlanderALN Was it always the plan to show Ian after he was taken whether it was flashback or in real time? #OutlanderALN How did Geillis learn of the prophesy? @OutlanderWriter Please let #LukeSchelhaas know he did a fabulous job. Hit the important stuff and pacing was perfect. I love this theory of Jamie’s that going through the Stones has awakened all the ghosts! 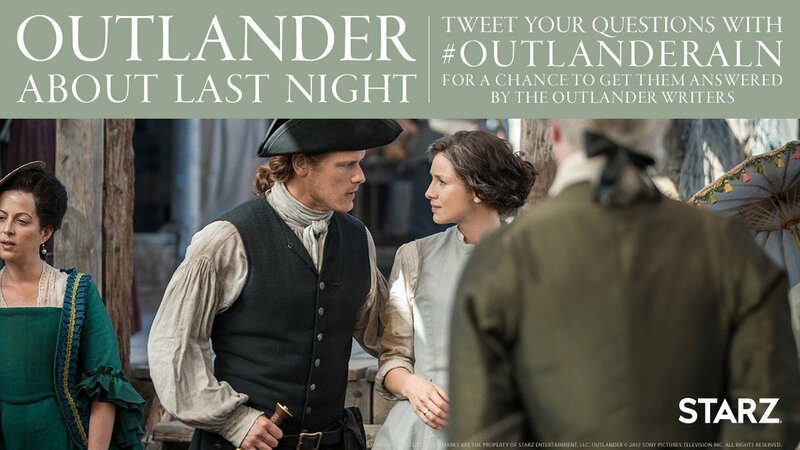 @OutlanderWriter #OutlanderALN How much of the episode is Scotland versus South Africa? Are there actors in the ep that did not travel to SA? @OutlanderWriter #OutlanderALN #TheBakra Logistically, how did the blood bath go down? Of what did it consist? Any CGI? @OutlanderWriter #OutlanderALN ~ You write Geilis all the best pop-culture lines! She would know Gin Joints (Casablanca 1942), Bob's Your Uncle (c.1887), and the *bloody* Case of Benjamin Button (F. Scott Fitzgerald 1922)! This entry was posted in Luke Schelhaas, Toni Graphia and tagged Luke Schelhaas, Season Three, The Bakra, Toni Graphia, Twitter Q & A by Sarah Ksiazek. Bookmark the permalink.